When you're ready to get serious about recording, it's time to step up to PreSonus Eris-series studio monitors. Cheap computer speakers and home-stereo speakers won't reveal the truth about your mix. They aren't designed for that. In contrast, Eris speakers are real studio monitors, delivering a very accurate response with a tight bass and very clear upper end. That's what you need in a home studio. The E5 delivers less bass than the E8 but according to Recording magazine's Mike Metlay (March 2013), "The rolloff in the bass was polite and smooth, and there was a lot of thump in kick drums and solid harmonic structure in bass guitars and low piano notes.... Mids were forward and rockin', with vocals and guitars prominent and detailed; on acoustic tracks, details like finger squeaks on strings and breaths for phrasing were clear and evident.... Highs were extended and smooth, without any edgy spikiness or resonances that leaped out; finger cymbals and hi-hats were clear and bright, and when an artist substituted a sample for the real thing, you could often tell." Indeed, thanks to well-designed Kevlar® low frequency transducers, low-mass silk-dome tweeters, responsive Class AB amplification, and professional acoustic-adjustment controls, all Eris models deliver the goods. Yet Eris-series speakers are ultra-affordable, making them a terrific value. 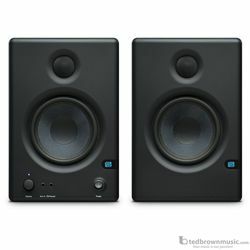 And with three models, you can easily find the Eris monitor that best suits your studio needs. When Size Matters: If space is at a premium, or if you want the ultimate in portability, consider the ultra-compact Eris E4.5. It may be the size of a computer speaker, but this mighty mite delivers professional audio quality, thanks to a 4.5-inch, Kevlar low-frequency driver; a low-mass, 1 inch, silk-dome tweeter with protective grille; and Class AB amplification. Each speaker is powered by a 25W Class AB amplifier-plenty of juice for a small speaker. The E4.5 ranges from 70 Hz up to 20 kHz, and at 6.42 x 9.45 x 7.09 inches (163 x 241 x 180 mm), you can shoehorn this little beauty into almost any studio space. The E4.5 has balanced 1/4" TRS and unbalanced RCA inputs, as well as unbalanced 1/8" inputs for your smartphone or MP3 player, giving you all the flexibility you need when replacing computer speakers or those old studio monitors that have misled your ears for the last time. Take a moment, if you will, to consider the E4.5's balanced TRS inputs; balanced inputs help you minimize noise-a pro feature you won't find on competing speakers in this class. That's not the only professional-class feature you get with Eris speakers that competitors can't match, though. Next, we'll discuss some higher-end features that truly set Eris apart from other budget-priced studio monitors. You're in control! Today's music producers deal with a wide variety of musical genres and often work in more than one location. It's easy to take your Eris speakers with you when you want to work in a different space. It's almost as easy to customize their sound for your room and type of music. The most basic control is the Input Gain, which determines the signal level before it reaches the power amp. This is part of gain-staging your overall system-that is, setting the levels for every part of the recording chain in order to get the optimal level of clean audio all the way through. Once you've gain-staged your system, you can leave this control alone. Safety Matters: Any loudspeaker is subject to an assortment of environmental and performance problems, and Eris monitors offer protection from most common of these. RF shielding protects against radio frequencies that could be induced into the signal and become audible. (If you've ever heard a radio broadcast unexpectedly coming out of a guitar amp, that's the result of RF interference.) Eris monitors also provide over-temperature protection to avoid heat-related issues, current-output limiting (to prevent damage should there be a short circuit on the speaker terminals), and subsonic protection to filter out extremely low-frequency vibrations that could interfere with the woofer's performance. Finally, Eris' power amplifiers have a "soft startup" so that you don"t get damaging pops in the speakers when you power them up. As you expect from PreSonus, Eris speakers use quality components, are well constructed, and deliver professional audio quality. They're lightweight and compact and look as professional as they sound. "What you are getting here is a monitor that should fit tidily into most rooms and will let you hear the detail in your mixes," says Trevor Curwen (Future Music). But what really sets them apart from comparably priced systems are pro features such as user controls that allow you to tailor the speakers' response to your needs. As Anderton notes (EM), "PreSonus's 'special sauce' is the set of controls." Don't just take our word for it, though-or even the words of top reviewers. Visit your PreSonus dealer and hear the Eris E4.5 for yourself!